Thrillpowered Thursday: Thrillpowered Thursday - 3. 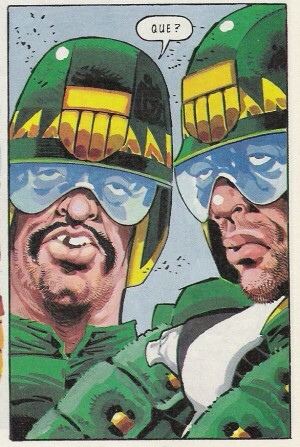 A blog comprising anecdotal, opinionated reviews of 2000 AD, the Galaxy's Greatest Comic, from the period of 1993 to the present. 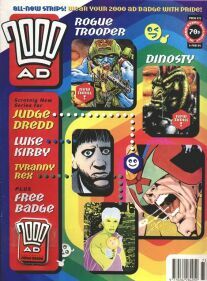 2000 AD and the Judge Dredd Megazine are published by Rebellion. Images used in this blog, except where noted, are copyright 2008-2011 Rebellion and are used for the purpose of review and commentary. Recap! Thrillpowered Thursday is a weekly look at the world of 2000 AD. I'm rereading my collection of 2000 AD and the Judge Dredd Megazine, one issue an evening, and once each week for the foreseeable future, I'll see what I'm inspired to write. Stereotyping by nationality has a long history in the pages of the Galaxy's Greatest. The late Massimo Belardinelli, when he would be picked to illustrate the Tharg the Mighty in-joke strips set in the editorial office, would caricature himself as constantly eating a giant bowl of pasta, for example. Those same strips would see Alan Grant wearing a tartan tam o'shanter. One of the greatest of all the Robo-Hunter strips was "Football Crazy," which shows the Japanese to be completely obsessed with cameras. It's so over-the-top as to be cringeworthy, but I think it works because (a) it's short, and (b) John Wagner and Alan Grant are much, much meaner to the British in this strip than they are to anybody else. In Robo-Hunter, Britain is populated by the most indolent and lazy people in the world, who only care about benefit checks and soap operas, unless it's World Cup season or a beloved stateswoman has been assassinated. If you're willing to poke lots of fun at yourself, to the point of being downright mean, then only the humorless or the stupid would take offense at the jabs at other nationalities. Judge Dredd's world didn't arrive fully-formed. About a year into the strip, we met a few judges from other cities during the "Luna-1" storyline. There, we learned that Texas City judges stood a good chance of being called "Tex" and wearing cowboy hats, and South-Am City judges had garish moustaches and spoke English with the random insertion of words like "muchachos," and the Sov judges of East-Meg One were grim authoritarians with hammer & sickle logos on their helmets whose broken English similarly found room for the word "comrade" whenever possible, the same way the X-Man called Colossus did in Marvel Comics. In fact, there are many similarities between these early attempts at international judges and the All-New Uncanny X-Men. You knew Wolverine was Canadian because he said "bub" and "eh," and Nightcrawler was German because he'd occasionally say "sehr gut" and Banshee was Irish because he called all the girls "wee lassie" and so on. Writers used little bits of language and small cultural bits to identify characters as coming from some other culture or nation. Playing with stereotypes to create these broad, comic backgrounds is rarely offensive, in part because we meet protagonists who are, for lack of a better word, heroic figures. The audience has a degree of sympathy and interest in Judge MacBrayne and DI Armitage, and even though Judge Joyce is mostly played for laughs as a country mouse in the big city, we still laugh with him, rather than at him. The judges from other cultures, the ones outside the typical 2000 AD talent pool, are also usually shown with some degree of heroism. Even Mark Millar and Grant Morrison's gang from Luxor City - that's future Egypt - come out decently in their own way. Sure, you've got the appropriate stereotypes ticked (pyramids, mummies, cobras on the helmets) and while the story rapidly degenerates into yet another Millar tale of muscled toughs beating each other senseless on a conveyor belt, it still gives us what's said to be an effective judge system, a sympathetic chief judge who's a good man, and an incompetent but heroic counterpart to Dredd in the form of Judge Rameses. But oh, boy, these guys in the Pan-Andes Conurb. McKenzie and Tomlinson have just got it in for Bolivia. Admittedly, John Wagner started the Dreddworld trend of Central and South America being full of corrupt thugs with moustaches. Ciudad Barranquilla was introduced in a 1990 storyline as a place where bent Mega-City One judges could try and make their getaway, and it's been expanded over the years to show that there's quite a number of rich criminal refugees supporting the local economy. To be honest, there's not a lot of positive portrayals of good judges in the Barranquilla waters, either. The Pan-Andes Conurb is, based on its depiction here, policed by the most incompetent judge force on the planet. It's filthy, it's stinking, there are flies and pack animals everywhere and the cops all look the other way. And you won't be at all surprised to learn that the chief judge (a) weighs about four hundred pounds, (b) has taco sauce all over his uniform and (c) is, like the rest of his force, in the pockets of the drug dealers. 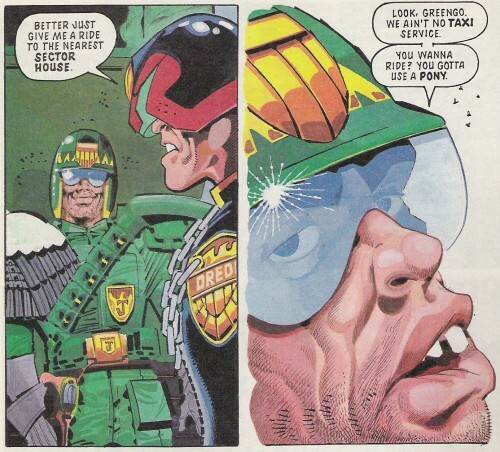 Like I say, the broad stereotypes in Dredd's world are there for comedy, and simple, unprovocative laughs. But somehow "The Sugar Beat" feels deeply uncomfortable in a way that even Shimura, with its "A New Japanese Stereotype in Every Storyline!" approach, doesn't manage. McKenzie, who no longer works in comics, often proved himself, with Luke Kirby and with some Doctor Who strips, to be an imaginative and talented writer. But when even Mark Millar can come up with better, and more effective nation-identity comedy, and stereotypes that amuse rather than aggravate, you have to wonder whether McKenzie was entirely the wrong guy for the Dredd beat.